Ufone SMS packages are the best SMS packages in Pakistan which facilitate the customers to their best satisfaction level. 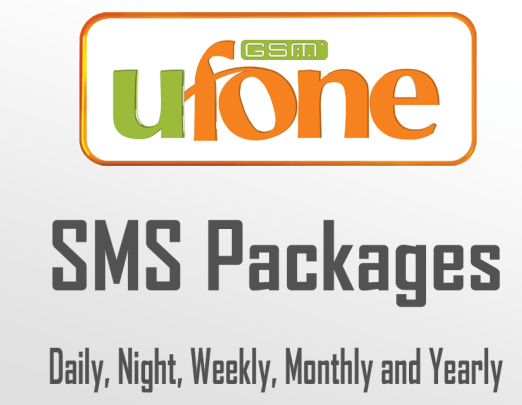 Ufone offers many types of SMS packages to its customers like a daily package, weekly packages, 15 days packages and monthly packages. And if you will recharge the next package within the expiry period then the remaining all messages will add in the new one. And this is a vital feature of the Ufone. With the numerous variety of the SMS packages, Ufone also provides all these packages at a very reasonable rate. So, all the customers can choose the best to satisfy their needs. And choose a suitable package for u to stay connected with the family and friends. Now in current life, messaging is the most popular medium to stay connected with our loved ones. All these amazing Ufone SMS Bundles play a key role to connect the people with each other. You have to just subscribe any bundle and move your fingers for an unlimited chat with buddies. For the subscription of Ufone Daily SMS Bucket, send SMS ‘sub’ to 605. 3.99 + tax will be charged for the subscription. The number of free SMS is 1,500. For the subscription of Ufone Daily On-net SMS Bucket, send SMS ‘sub’ to 611. 2 + tax will be charged for the subscription of Daily On-net SMS Package. The number of free SMS is 500. This package is only valid for Ufone to Ufone SMS. For the subscription of Ufone Night SMS Bucket, send SMS ‘sub’ to 609. 1 + tax will be charged for the subscription of Night SMS Package. The number of free SMS is 300. Validity is 8 hours i.e. from 12 am to 8 am. For the subscription of Ufone Fortnightly SMS bucket, send SMS ‘sub’ to 603. 30 + tax will be charged for sending SMS to any number or any network of Pakistan at any time i.e. 24 hours a day. The number of free SMS is 10,000. For the subscription of Ufone Monthly Unlimited SMS bucket, send SMS ‘sub’ to 607. 80 + tax will be charged for the subscription of Monthly SMS Package. The number of free SMS is 20,000. For the subscription of Ufone 45 days SMS bucket, send SMS ‘sub’ to 614. 99 + tax will be charged for the subscription of 45 Day SMS Package. The number of free SMS is 30,000. For the subscription of Ufone Yearly SMS bucket, send SMS ‘sub’ to 601. 666 + Tax will be charged for the subscription of Yearly SMS Package. The number of free SMS is unlimited (Fair Usage Policy of 100,000 SMS is applied). For the subscription of Uth SMS FnF Monthly Bucket, send SMS ‘sub’ to 604. 5 + tax will be charged for sending unlimited SMS to any number or any network of Pakistan at any time i.e. 24 hours a day. The number of free SMS is unlimited. This package is only valid for Uth Package Customers. For the subscription of Uth daily SMS bucket, send SMS ‘sub’ to 612. 1.99 + tax will be charged for sending SMS to any number or any network of Pakistan at any time i.e. 24 hours a day. The number of free SMS is 600. For the subscription of Uth Weekly SMS bucket, send SMS ‘sub’ to 608. 10 + tax will be charged for sending SMS to any number or any network of Pakistan at any time i.e. 24 hours a day. The number of free SMS is 1,200.